I gave this book 5 stars. This is the 17th book in the Immortals After Dark Series and the second book in the Dacians series. It can be read as a standalone, but I personally feel that reading the whole series in order really enhances the experience.Anyway, if you guys love adult romance, this is the series for you. 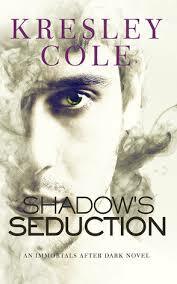 I love Kresley Cole’s writing style, which is why i continue to keep reading her books. I also love her characters. They’re just so fun and badass, plus they’re hilarious. I love gay romances. I’ve read so many straight romances that I know the drill. It’s a bit hard to surprise me in that aspect. Gay romances, however, are an entirely different thing. They have their own different set of struggles. This is some new territory and I love exploring it. I think this book did a fantastic job of that. The one thing that just kept psyching me out was the fact that at the start of the book Mercio was older and then in the middle it was switched around and Cas was older. I kept forgetting and it just weirded me out. My personal favourite part of this book was when we all thought that Lothaire was a raging homophobic but he really just didn’t like demons. Beautiful. I almost forgot to mention, it actually happened! A book in this series came out without any Nix! I miss my Nix! “You stay on me like my godsdamned shadow, vampire."